Christ Church is a historic, Anglo-Catholic parish adjacent to the campus of Yale University, next door to Pierson College. The parish is located in a small city in coastal Connecticut. The neighborhood is dominated by Yale University, and many parishioners have some affiliation with Yale. Many parishioners drive past several other Episcopal churches to come to Christ Church, because of its distinctive worship life. The area population (defined by a three-mile radius) is remarkably diverse: 34% white, 33% African-American, and 25% Latino. It is also significantly younger than the state average (35.20 vs. 40.50; the median age for the area is still lower, at 31). Per capita income in 2016 is estimated at $23,312, below the national average of $33,205. Because the city of New Haven is fairly compact, the three-mile radius in the statistical study area includes much of the city, as well as portions of nearby Hamden and West Haven--and seven other Episcopal churches. Christ Church hosts the Community Soup Kitchen, a major operation that prepares hot meals five days per week for people in need. In one recent month, they served 7,000 meals. CSK also operates four breakfast sites, plus a satellite site at neighboring parish that offers lunches twice a week. The rector sits on its board of directors and several parishioners volunteer with the program. For a gallery of images from the Community Soup Kitchen, click here. Another important ministry of Christ Church is St. Hilda's House, an intentional community of young adults affiliated with the Episcopal Service Corps. Members serve in placements at non-profits around the New Haven area, worship at Christ Church, and take part in a program of formation, while sharing in a common life in a house on the Christ Church campus. The church building is a Gothic Revival structure, built between 1895 and 1898, with a deep, elevated chancel, a rood screen, and transepts. Rather than fixed pews, the congregation sits in chairs. An imposing font is at the west end. The early eucharist is a straightforward, Rite One eucharist without music in the side chapel. Attendance normally runs between 18 and 25. On the Sunday of the site visit, the congregation includes adults of all ages. The celebrant is assisted by a server. At the sound of a bell, the congregation stands. The priest and server enter, genuflect before the altar, take their places, and begin the liturgy. The opening acclamation and Collect for Purity are followed by the Kyrie and Collect of the Day; the optional Summary of the Law is omitted. After the Collect of the Day, the congregation sits. The server reads the epistle, and the congregation recites the psalm in unison. The celebrant reads the gospel and preaches a brief homily, just under five minutes in length, on the readings for the day (on the parable of the Pharisee and the Tax Collector) and on the issue of stewardship, as it is "Commitment Sunday," the day on which pledge cards are due. The contemporary version of the Nicene Creed is used. The congregation prays the Prayer for the Whole State of Christ's Church and the World and then kneels for the confession, using the traditional version. After the absolution the Peace is exchanged (the optional "Comfortable Words" are used on occasion). Announcements are brief. Ablutions are done at the altar. The postcommunion prayer is said, the celebrant blesses the people, and he dismisses them. After the exit of the celebrant, the congregation waits to leave until the server returns and extinguishes the altar candles. The celebrant greets the congregation at the door to the chapel. Some members of the congregation remain for silent prayer. The service has lasted thirty-five minutes from start to finish, without feeling rushed. The 9:00 eucharist uses Rite Two texts and hymns from the Hymnal 1982. A portable altar is placed at the crossing, and the presider faces the people across it for the eucharistic prayer. Incense is used. The congregation is varied in age, ethnicity, and gender, and there are about 22 present (the normal range is 25 to 35). The clergy and one lay assistant enter from the transept during an organ prelude and reverence the altar. The curate presides at this liturgy, vested in alb, stole, and chasuble, while the rector is vested as a deacon, in cassock, surplice, and stole. The opening acclamation and collect for purity are said in front of the altar, and then a hymn is sung as the "song of praise," in place of the Gloria (the service music shifts seasonally, and a hymn is sung. After the collect of the day, the clergy take their seats. A lector from the congregation reads the epistle, which is followed by a psalm sung to Anglican chant. The rector reads the gospel from the midst of the congregation, then preaches from the same location. He preaches without notes, an expanded version of the homily he preached at the 8:00 low mass (lasting eight minutes). The congregation joins in reciting the Nicene Creed, and then the rector (as deacon) leads the intercessions, using form 4 from the prayer book. The rector leads the confession of sin, after which all stand and exchange the peace. After the announcements, the rector sets the table (with the assistance of the server), while an offertory hymn is sung. During the eucharistic prayer (which is prayer B from the 1979 BCP), most of the congregation remains standing. The celebrant elevates bread and cup after each set of words of institution. The traditional form of the Lord's Prayer is used. After the invitation, the congregation comes forward to receive communion, standing before the altar. Ablutions are done at the table, after which the clergy and server return to their seats for the postcommunion prayer. The celebrant blesses the people, the rector gives the dismissal, and the clergy process out the way they entered. Solemn High Mass draws the largest congregation of all of the liturgies. About 75 people are in attendance at the start of the service. Godly play is offered during the 11:00 liturgy, with the children joining the congregation for communion, so the congregation grows partway through the service. (This service is the most popular one for families with children.) The congregation is a mix of young and old, with some ethnic diversity. The service follows Rite One in the 1979 prayer book, using Eucharistic Prayer II (the prayers shift seasonally; Eucharistic Prayer I is used in Lent, Advent, and Easter). It begins with an organ prelude. After the prelude, there is a brief period of silence, then a lengthy organ introduction (about two minutes in length) to the opening hymn, during which the procession of acolytes, choir, and clergy enters from the north transept, turning and entering the chancel. The traditional three sacred ministers--celebrant (the rector), deacon (the curate, vested as a deacon), and subdeacon (a layperson in a tunicle)--genuflect at the altar. The choir is in place before the singing of the hymn begins. The celebrant censes the altar during the hymn. The celebrant chants the opening acclamation and reads the collect for purity and the summary of the law. The Kyrie and Gloria (and the rest of the Ordinary of the Mass) are sung to a setting by Thomas Causton (d. 1569). (The service music changes regularly, with some settings sung by the congregation as well as the choir.) The celebrant chants the Collect of the Day, and then all are seated. A lay person reads the Old Testament lesson from a lectern, and then the choir chants a portion of Psalm 84 to an Anglican chant by C.H.H. Parry. The subdeacon reads the epistle from the chancel steps, after which the congregation sings a hymn, in this case a metrical version of the same psalm that had been read earlier. A gospel procession, with thurible and torches leading the way, moves into the midst of the congregation. The curate, vested as a deacon, chants the gospel. A bit of subtle organ music covers the return of the gospel procession, and the choir exits the chancel and files into seats in the nave in front of the pulpit. The celebrant climbs the pulpit and preaches a version of the same sermon from the 9:00 liturgy (the sermon at this liturgy typically lasts 15 minutes). The sermon is effective, delivered seemingly without notes while appearing tightly organized, and the preacher is warm in his affect. After the sermon, the celebrant descends the pulpit and stands with the curate and subdeacon at the head of the center aisle, in the crossing, facing the altar. The clergy and people sing the Nicene Creed. All genuflect at the reference to the Incarnation. The curate walks back the center aisle to more or less where the gospel was read to lead the prayers of the people (using form 4 from the prayer book, adapted to use "thy/thine" instead of "your." After the concluding collect, the curate rejoins the celebrant and subdeacon and leads the confession (during which all kneel), and the celebrant gives the absolution. The congregation exchanges the peace, and the choir files back into the chancel. The celebrant makes announcements from the lectern, and then the clergy and lay assistants move back into the chancel. As the choir sings an anthem, the ushers collect the people's offerings. An offertory hymn is then sung, during which the monetary offerings and the bread and wine are brought forward, led by the torchbearers. The curate (functioning as deacon) prepares the altar, assisted by the subdeacon. The celebrant comes to the altar and reverences it. He receives the thurible, and with the deacon and subdeacon on either side holding back the hem of the chasuble, the celebrant censes the gifts and the altar. The deacon then receives the thurible and censes the celebrant and subdeacon in turn. The thurifer receives back the thurible and censes the deacon. Finally, the thurifer moves to the entrance to the chancel, turns east and censes the choir and other persons in the chancel, then turns west, descends to the crossing and censes the people. Meanwhile, the celebrant, deacon, and subdeacon take their places in descending order on the altar steps. The thurifer then returns inside the altar rails and stands to the side, gently swinging the incense, and two torchbearers flank the opening to the altar rail. The celebrant faces the people to sing the sursum corda, turning back to the altar for the preface. The choir sings the Sanctus (by Causton). The subdeacon and deacon climb the altar steps to stand on either side of the celebrant. At the end of the sanctus, all except the celebrant kneel. The celebrant continues the prayer, and sanctus bells are rung once just before the start of the institution narrative. At the conclusion of the words over the bread, the sanctus bells are rung thrice and the bell in the church's bell tower is tolled while the celebrant genuflects and elevates the bread. The same procedure is repeated for the words over the cup. The subdeacon and deacon rise to stand on either side of the celebrant for the conclusion of the prayer, at which point the celebrant elevates bread and cup. The Lord's prayer is sung, and the celebrant and people chant the "Christ our Passover" fraction sentence, after which the choir sings the Agnus Dei (by Causton). The celebrant communicates himself and the deacon and subdeacon during the Agnus, after which the three face the people, holding ciborium and chalices, and the celebrant gives the invitation to communion. (During Lent, the Prayer of Humble Access immediately precedes the invitation.) The decision to communicate the clergy before the invitation was a pragmatic one, to try to compress the delay between the invitation and the delivery of communion to the congregation. All come forward to receive communion at the altar rail, where the celebrant and curate distribute bread and the subdeacon and three other chalice bearers distribute wine. Children of all ages come forward and receive communion alongside their parents. The choir sings an anthem by Johannes Brahms during the distribution, which is followed by a communion hymn. Once all have received, the celebrant, deacon, and subdeacon go to the altar to cleanse the vessels. The celebrant leads the postcommunion prayer from the altar, the people kneeling at their seats. After a blessing by the celebrant and the dismissal sung by the curate, the organ strikes up a voluntary, and the choir, assistants, and clergy depart in procession, turning right after they exit the chancel to leave by the transept. The rector and curate position themselves at the two main points of egress from the church to greet everyone. Some stay afterwards to pray at the Mary shrine, while others go to coffee in the parish hall. For compline, the choir is located in a loft in the north transept, out of view of the congregation. The only illumination is provided by candles, and before the service begins the church is filled with incense smoke from a brazier, all prepared by the young adult interns of St. Hilda's House, an intentional community affiliated with the Episcopal Service Corps. The curate overseeing St. Hilda's House uses a thurible to cense the altar before the service starts, adding more clouds of incense. Once preparations have been made, the St. Hilda's House interns (on this night, donning cloaks over their cassocks because of the cold) and stand on the sidewalk and at the doors, welcoming those who come to the service. The congregation files into the church: there are people of every age, ethnicity, and gender, but most are in their teens and twenties. There is no worship bulletin for Compline. Music includes plainchant and polyphony, sung in English and Latin. The service follows The Order of Compline... from the Salisbury Antiphoner, adapted by G.H. Palmer and published in 1899, with the scriptural readings drawn from the options on the 1979 Book of Common Prayer. The congregation listens silently to the choir sing the liturgy. In the pregnant silences, the rare and occasional cough (it being October) reverberates like a cannon shot. The congregation appears to treasure the silences as much as the chant. Some stare at the altar and candles through the haze of incense smoke; others close their eyes in prayer or contemplation. After the service, some leave, while others mingle in a "cider hour" in the parish hall. The rector is the chief planner of worship. He works with the choirmaster and the curate, and he consults with the principal organist and the master of acolytes as needed. The parish uses the 1979 prayer book and the Hymnal 1982. On rare occasions, there are some limited interpolations; the basic principle is to do the entire prayer book liturgy, and sometimes to add material but never to subtract or substitute texts. The bulletins for the 9:00 and 11:00 liturgies supply all of the texts and service music that the congregation needs, and refers them to the Hymnal 1982 for hymns. The parish has a detailed customary of worship, developed many years ago. When outside authorities are needed, the rector consults the 1549 Book of Common Prayer, Ritual Notes, and Michno's A Priest's Handbook. His goal when presiding is a Catholic style that is "clean and elegant," and not fussy. The curate is a bit more elaborate in his gestures, but the ad orientem celebration means that the variation in style is not noticeable to the congregation. Overall, the culture of the parish values liturgy highly, but it holds a balanced perspective: in the words of the rector, "precise but not anxious, serious but not precious," with a generosity of spirit. In planning worship, the rector keeps before him the goal of "showing people Jesus" and helping them to "see the Holy Spirit moving in their lives." Solemn High Mass is the distinctive morning service. It embodies a tradition that can be traced back to the 19th-century Ritualists who founded the parish, and it contains elements of pre-Reformation liturgies. The music is stunning, drawing on the talents of students and faculty from the Yale's music school and the Institute of Sacred Music. This is true "multi-sensory worship" (though admittedly not in the way that the inventors of the trendy phrase may have imagined): vocal and instrumental music, incense, the elaborate choreography around the altar, the taste and touch of the eucharistic elements all combine in ways that move the worshipper. While ordinarily one would not want to see a priest vested and functioning as a deacon (as the prayer book has directions concerning the division of a deacon's duties among celebrant, assisting presbyter, and laity), there are few deacons in the Diocese of Connecticut. Recalling that all priests in the Episcopal Church, under the current canons, have been previously ordained as deacons, there is an argument for using priests as deacons at Christ Church that is made still more persuasive by the demands of Solemn High Mass. Similarly, while the order of subdeacon was suppressed by Cranmer in the sixteenth century (and by the Roman Catholics in the twentieth), the choreography of Solemn High Mass presupposes a subdeacon. Christ Church vests a layperson in the tunicle of a subdeacon, which has the beneficial effect of putting a layperson in a prominent liturgical role. Perhaps the most striking service of the day is Compline, which in the abstract would appear to be the "least likely to succeed," as a monastic office with archaic texts, an even more archaic musical idiom, and structure designed for a passive congregation. Yet despite--or perhaps in part because of--this countercultural flavor, this liturgy had the largest, and youngest, congregation of the day's services. When asked afterwards about what drew them to Compline, several college students remarked on the contemplative nature of the liturgy. One noted that this was the one time in her week to sit and think quietly. Several also noted that the music is "incredible," which it is: the nearby presence of Yale's Institute of Sacred Music, as well as the School of Music, means that there are many skilled singers in the community. 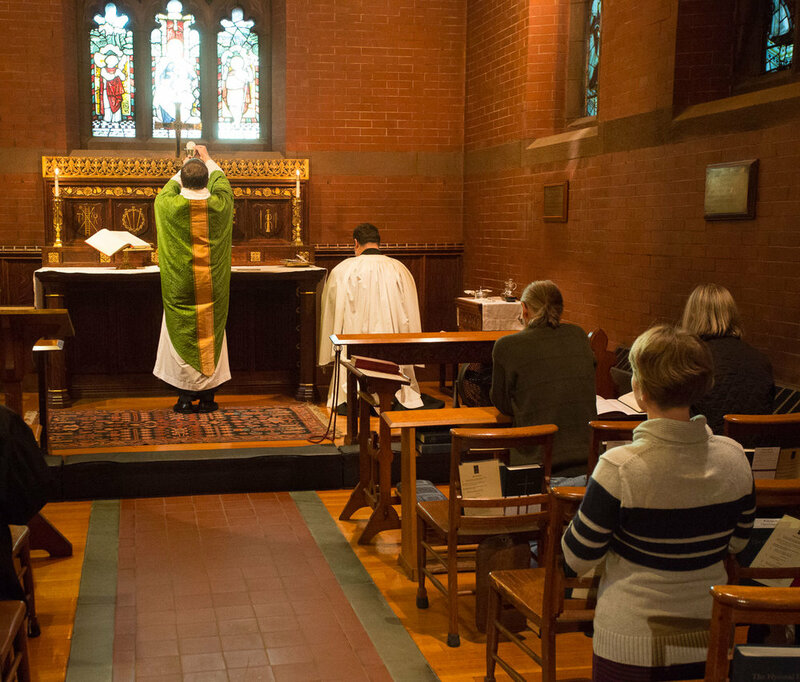 An evening service such as Compline also works well in an academic community: undergraduates may not find an early morning "low mass" to fit their typical sleep/wake cycles, especially after a busy Saturday night. Conversely, typical undergraduates do not rise as early as typical families with small children. Christ Church's proximity to a large, undergraduate campus means there is a natural clientele for an evening service. The archaic, contemplative nature of Compline may also be part of its success. Older texts and musical settings help create a sense of mystery, just as much as the relative darkness of the space and the clouds of incense smoke. This seems to appeal to students whose primary engagement with the world, during the rest of the week, is through their rational faculties. 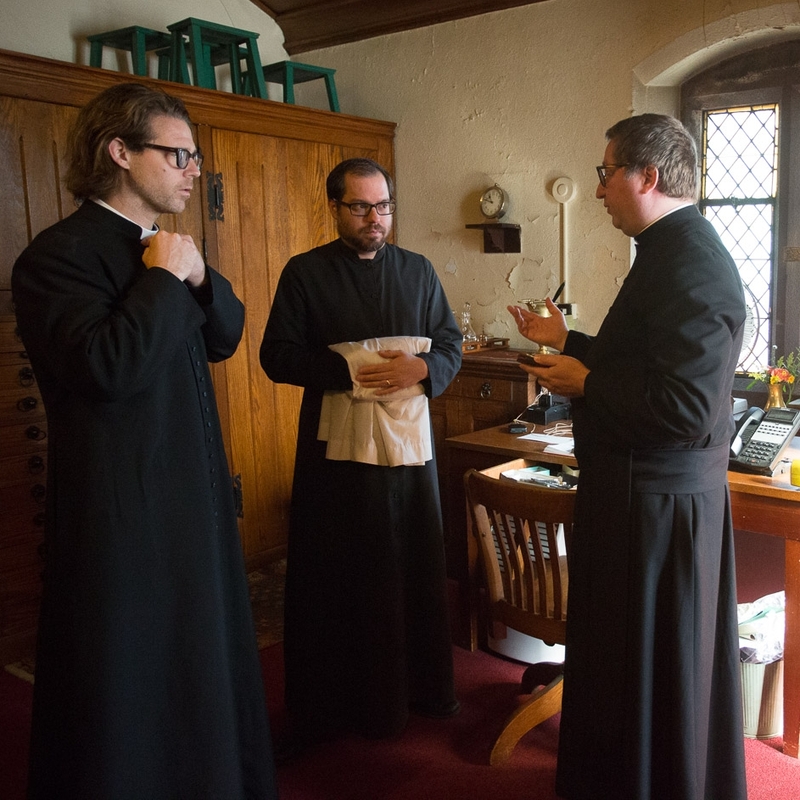 A contemplative service offers a respite to students at a highly competitive university.